Christian faith and religion was one of the main overriding factors shaping Late Antiquity and the Middle Ages both in Hungarian and universal history. Its numerous monuments can be found throughout Europe and the Middle East. These monuments constitute the common cultural treasure of our contemporary society and its people, may they be Christians or non-Christians. The Hungarian Catholic Church and its members played a profound role in formulating and spreading the scholarly attitude to archaeology and also in elaborating its methodology. The academic interest in the early Christian era is apparent in the works of Péter Pázmány, and the university established by him in 1635, was the first Hungarian institution to found the Department for Numismatics and Archaeological Studies in 1777, with the leadership of István Schoenwiesner, who later became canon in Nagyvárad. This was the institution to carry out the first Hungarian excavation in Aquincum, the Roman capital of Pannonia Provincia (the present day Flórián square in Budapest) in 1778. Modern scholarly archaeology in Hungary is the product of the activity of two high ranking Catholic priests in the 19th century: Arnold Ipolyi, bishop of Besztercebánya (later transferred to Nagyvárad), launched the journal of Archeologiai Közlemények (News in Archeology) in 1860 as its editor, and the other notable active in the field is referred to as „the father of Hungarian archaeology” – Flóris Rómer, canon of Nagyvárad. As the university belongs to the Hungarian Catholic Church with priceless treasures of monuments and other cultural artefacts, the Department of Archaeology launched at the Faculty of Humanities attempts to meet a long standing ecclesiastical and social demand. The archaeological training at Pázmány Péter Catholic University, - in accordance with the profile of the university-, focuses on training specialists for excavating, studying and preserving the artefacts that originate from the appearance of Christianity to the early modern age, in addition to providing archaeological studies of general nature. The highly practice centered training - besides national and international research programs, introduces the students to field research programs that provide diverse experience and expertise with the help of institutional partners at an early phase of their studies. Based on the tradition of the Faculty of Humanities at the PPCU, instruction providing a good knowledge of Classical languages necessary for the particular field of study forms an organic part of the curriculum, (in addition to the generally required Latin, either a specialized Latin, Greek, Arabic or Syriac course is to be taken, according to the chosen era to be studied in depth from the sixth semester). Specific information technology training formulates a prominent element in the studies (use of software for building databases, GIS, computer assisted modelling, graphics), which besides the archaeology degree, can also serve as an asset in other different fields in the hands of our students. 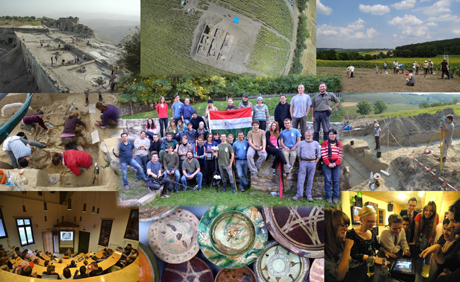 All throughout the year the opportunity for field practice is supplied for the students in addition to the compulsory amount, both on our departmental excavation base at Esztergom and also within the framework of several of our national and international research programs. The designated goal of our Department is to supply most of the possible extra opportunities suitable for the talent and skills of each and every student in order to become a reliable and competitive specialist on the international market as well. Students who have graduated at the BA level that qualifies them as technicians of archaeology, will have acquired useful knowledge in the fields of archaeology related computer sciences, theoretical reconstructions, monument protection, museum management and could have the opportunity to acquire basic skills in conservation and restoration. Those who have the ambition to continue their studies have the opportunity to pursue that at MA level.